Ultimatum is WordPress page builder theme. It is something not seen very often and you could call it ‘total design suite’ for WordPress. If you’ve some knowledge with building a WordPress themes, you know that it takes time and effort, especially if you have a limited HTML and CSS knowledge. Ultimatum WordPress page builder theme takes care of your theme coding and make sure all functions work properly. The Ultimatum WordPress theme builder is one of the few tools to create your own themes, export them and even create on demand templates for your customers. The main selling point of this WordPress page builder is that it gives you the freedom to create the theme you want while providing every feature or setting you will ever need, including various popular WordPress plugins for free! 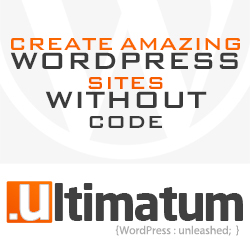 Ultimatum is a framework that you can use to build a custom WordPress theme from scratch. If you’re ever wanted to build a WordPress theme with bootstrap, then save your time with other tools and try the Ultimatum builder. You can build powerful themes and export them as Ultimatum or Twitter Bootstrap templates. This drag and drop WordPress theme builder lets you create your own layouts which can be boxed, full width or custom dimensions. You can drag and drop elements directly in the header or in the footer section in your template. The good thing is that you can enable or disable the responsive mode in your theme which will give you more control over the layout. Ultimatum WordPress page builder theme is installed just like a regular theme. Either via FTP upload or through your WordPress admin dashboard. Once it has been uploaded to your WordPress site, it can be accessed via themes control panel where it can be activated with your API key. Ultimatum also recommends the installation of a free plugin called the Ultimatum Library. This plugin contains the fonts and images used by the theme. If you get 404 error when installing Ultimatum library plugin just download it and then upload before installing it. Once the theme has been setup, and before you’ve done anything, you are presented with a blank canvas to build your designs on. The settings page for Ultimatum allows you to set site wide items such as the default logo, a favicon and an image placeholder. You can also create the sidebars the theme will use by entering their names. NOTE: By default, most of these features are disabled and can be enabled via the Advanced Settings under the Theme Settings page. In the Layout Editor Options it is recommended to turn on the Elements at bottom option which you will use when building page layouts. Otherwise they will be displayed in the sidebar, creating a very long page. The templates section allows you to create and import templates. When creating a template you can choose to use the Ultimatum grid framework or select the Twitter Bootstrap from the available options. Each has their own settings such as element widths and margin sizes. These options show that Ultimatum WordPress page builder theme is a good choice for those wishing to build WordPress sites for different devices. Once you’ve created a template go on to design the layout. Ultimatum also includes a Custom Post Type creator which makes creating additional WordPress post types and custom taxonomies easy. When creating a new post type you can easily choose what elements your posts type will have such as Titles, Comments, Categories and Tags. From the general settings menu you can access the library which contains the fonts and icons used by the Ultimatum theme builder. Fonts can be enabled form a range of sources including Google Fonts and Cufon. After installing the library plugin you get access to a very large selection of icons for use in your designs. Ultimatum’s layout builder is very powerful yet very simple. If you’re familiar with the WordPress UI, the learning curve is pretty small. To get started, you simply create a template. After you select your settings for your template, you create site’s “layouts”. The great part about this is that you can create both partial layouts (header and footer) and full layouts that can include your partial layouts. Layouts can be sectioned off into many different column variations like 1/2, 1/3, 1/4, 2/3. etc. To fill in your layouts Ultimatum allows you to easily drag and drop any of the WordPress widgets or any of the Ultimatum widgets into the layout’s sections. To include posts and pages, you simply include the WordPress Default Loop widget and Ultimatum lets you customize even further. Ultimatum WordPress page builder theme also works great with WooCommerce. Create an eCommerce site with WooCommerce and make revenue. Ultimatum is connected to WooCommerce with many features. Just create a layout for your shop pages and you’re good to go. Ultimatum theme is also optimized for BuddyPress and bbPress. Ultimatum comes with a unique layout builder in which you are able to drag and drop native WordPress widgets. Unlike other frameworks you are not bound to specific add-ons. You can use any plugin or any widget in Ultimatum with just dragging and dropping them in to your desired position of layout. Ultimatum’s CSS editors makes you to set your desired styling with ease. Each element defined in back-end can be styled with just filling the forms and setting the options. You can also type in your custom CSS in live editor and see results on-screen right away. In addition to classic 960 grid system, popular grid framework choices were also added to Ultimatum with all features and Bootswatches. Since Ultimatum 2.7 support for Bootstrap 3 is added. Now creating Bootstrap Powered WordPress themes is just matter of clicks. Ultimatum can create responsive web sites with few easy steps. However sometimes you want to show your visitors a different website for different device. That will lower your bandwidth and increase visitor reach to content. This is only available when you use mobile web apps and Ultimatum gives you the freedom for it. Ultimatum’s front end CSS editor is very simple to use. Changes display immediately. Between Firefox’s inspect element and Ultimatum’s CSS editor, customizing the CSS of your site can be handled entirely from the front-end of your website. You’re not limited when it comes to which sliders you can use to display slideshows on site using Ultimatum. It integrates with most popular sliders for WordPress like Layer Slider, Slider Revolution and ShowBiz Slider. The best part it that you don’t need to buy slider plugin. They already come in package with Ultimatum. It also comes with its own slideshow generator. The WP Bakery Visual Composer is one of the most popular drag and drop editors for WordPress. It lets users create layouts and add all sorts of elements to their pages and posts. Ultimatum includes the plugin as a standard part of the theme and can even be turned off if you don’t want to use it. Ultimatum lets you design your site using seven different menus. Regular menus, drop-down and mega menus are available in both vertical and horizontal layouts. You can also use a Twitter Bootstrap menu. You can even create multiple menus for theme. Using Ultimatum page builder, you can create your own custom post types. You could also try using a plugin to create custom post types so that your post types aren’t theme-dependent. Custom Post Types UI and WP-Types are both good ones. Ultimatum allow you to create highly responsive designs. It is possible to design your own web apps for website. Created theme will work great on any handheld device. Once purchased, Ultimatum comes with lifetime updates. That means you don’t have to pay each year to continue receiving updates. Since purchasing Ultimatum, it has been updated a few times to fix bugs and add features. It is good to know theme is constantly maintained. I’ve heard that the overall support for Ultimatum can be sketchy at times due to health reasons from the developer. This isn’t from my experience so I am not counting this as a weakness. Ultimatum with its core features also comes with ~$240 valued Premium Plugins for FREE. All plugins included are customised and tested to work with Ultimatum and together with no issues. 1. Visual Composer Page Builder – Visual Composer for WordPress is drag and drop front end and back-end page builder plugin that will save you tons of time working on the site content. You will be able to take full control over your WordPress site. No programming knowledge required. 2. Slider Revolution – Create a responsive or full-width slider with various effects and also keep or build your SEO optimization. 3. Layer Slider – LayerSlider is a premium multi-purpose slider for creating image galleries, content sliders and mind-blowing slideshows. It uses cutting edge technologies and comes with more than 200 preset 2D and 3D slide transitions. 4. Essential Grid – Essential Grid is a premium plugin for WordPress that allows you to display various content formats in a highly customizable grid. Possible applications range from portfolios, blogs, galleries, WooCommerce shops, price tables, services, product sliders, testimonials and anything else you can imagine. 5. Showbiz PRO – Showbiz Pro is a responsive teaser displaying solution that allows you to show WordPress Posts or any Custom Content with a set amount of teaser items. You can define everything via CSS or HTML in optional Template Skin Editor which gives you Unlimited Layout possibilities. 6. Go Responsive Portfolio – This plugin is the ideal solution for creating portfolios, showcases or teasers. You can create new custom post types or use your existing blog posts, custom post type posts or products. If you would like to create a portfolio or looking for a complete solution managing portfolios, this product is a useful tool for you. 7. Ultimate Addons for VC – This plugin adds new premium elements to Visual Composer on top of the built-in ones given by WPBakery. 8. Intense Shortcodes – Intense includes a list of 100+ shortcodes and 17 custom post types (FAQ, Portfolio, Project, News, Coupons, Snippets, Templates and many more). 9. DHVC Form – Powerful form manager for Visual Composer which allows you to create and manage forms easily. Build complex forms as Booking form, simple Contact form or Login/Register form. 10. Easy Tables – Table manager for Visual Composer which allows you to create and manage tables with drag and drop interface. 11. Templatera – Templatera allows you to create, manage and set control access to your templates based on user roles or page post types. 12. Ether Forms – Ether Form Builder WordPress Plugin is a form building tool aided with visual composer for creation of complex form layouts. It comes equipped with all commonly used form elements accessible via interactive Drag and Drop interface. Ultimatum WordPress page builder theme makes custom designs much simpler and reduces production time. The value it provides is one of the best value in the WordPress market. It’s a very powerful tool that is worth every penny. I like the simplicity of Ultimatum WordPress page builder theme. The model is mostly intuitive and easy to get to know with. Various premium plugins included with Ultimatum is huge plus and major bonuse. If not sure buyer can opt in for free “test drive.” You just enter email and name and you will instantly receive login data to demo site where you can try to see if Ultimatum theme is really worthy investment for you. Price is $65 for starter license and $125 for professional license. You can use Ultimatum starter license on unlimited number of domains. However support will only be given for one domain. Payment is one time and you get lifetime updates. Have you used Ultimatum or any other WordPress page builder theme? Do you think it is worthy investment? Let me know in comments below!